Atlas Converting Equipment Ltd. (Bedford, UK) is very pleased to announce that it has won the coveted C2 European Converting Innovation Award for 2013 at the ICE Europe exhibition in Munich, Germany for the advanced design & technology of its ‘next generation’ Titan SR9 Series slitter rewinders. 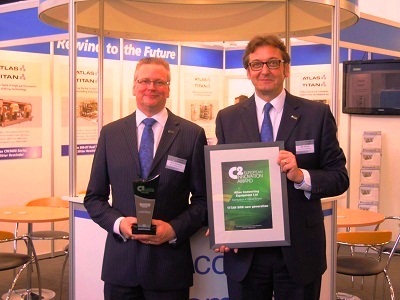 The Award was presented to Alan I. Johnson, Managing Director of the company and Barrie K. Homewood, Sales & Marketing Director for the Titan product range on 19th March on the C2 Converting magazines stand at the ICE Europe 2013 event. From a list of almost 50 applications for the Awards, the Titan SR9 Series was the exclusive winner in the slitting & rewinding category. In the development of the Titan SR9 Series, Atlas focused its product development strategy on achieving significant reductions in machine downtime for printers & converters, with lower operator intervention and also reduction of costly waste materials – which all adds up to outstanding gains in productivity. The concept of the Titan SR9 Series technology platform features three separate machine modules of unwind, slitter & rewind sections. The idea being that a converter need only change the rewind section of the machine from a Duplex Shaft (DS) to a Single Turret (ST) or Dual Turret (DT) configuration, to meet changing production requirements, without the need to change the existing unwind and slitting modules. The Dual Turret (DT) module was launched at the end of 2011 and the Duplex Shaft (DS) module was introduced during 2012. Innovative engineering design has led to the application for three patents (one granted, 2 in process) on the Titan SR9 Series and has led to significant improvements in the quality of slit reels and significant reductions in set-up procedures. A newly designed Linear Tracking Slitter (LTS) section ensures the shortest and a constant web length between the knives and the rewind shafts for improved web control giving the highest possible side wall quality of rewind reels and also reducing the possibility of waste material.Between all three versions of the Titan SR9 platform, many other new features provide exceptional performance and productivity at running speeds of up to 1,000 m/min. The SR9 Series is available in two widths – 1650 and 2250 mm.